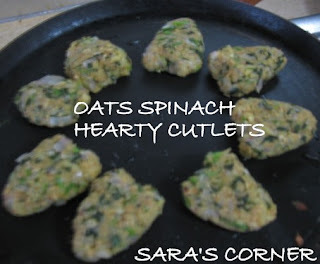 Oats Spinach Hearty Cutlets are very tasty and healthy. This can be ready in a jiffy. Oats - 1 cup(100gms) - I used quaker oats. Dry roast oats in a kadai till its slight brown and transfer it to a plate. In a same kadai, add 1 tspn oil, add ginger garlic and saute for few mins. Add onion, salt, green chilli and saute till its transparent. Keep the stove in low flame. Add oats and mix. Add grated potato and paneer if you are using it and mix well. Finally add potukadalai maav/besan and mix well to form a dough. Allow it to cool and make small balls and give whichever shape you desire. Heat a skillet or tawa, add oil and shallow fry both sides till brown. You can also deep fry, by coating in bread crums. 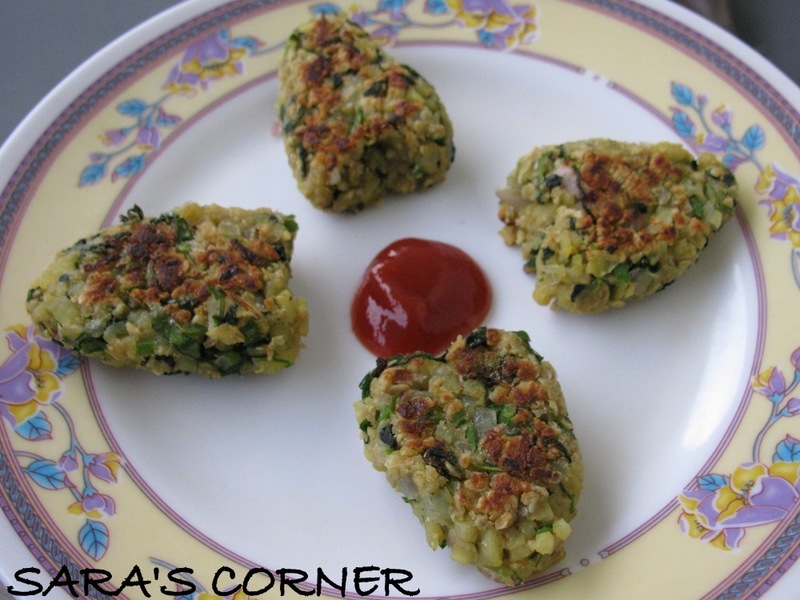 Healthy and Tasty Oats Spinach Hearty Cutlets is ready to serve. You can serve with Ketchup or chutney. 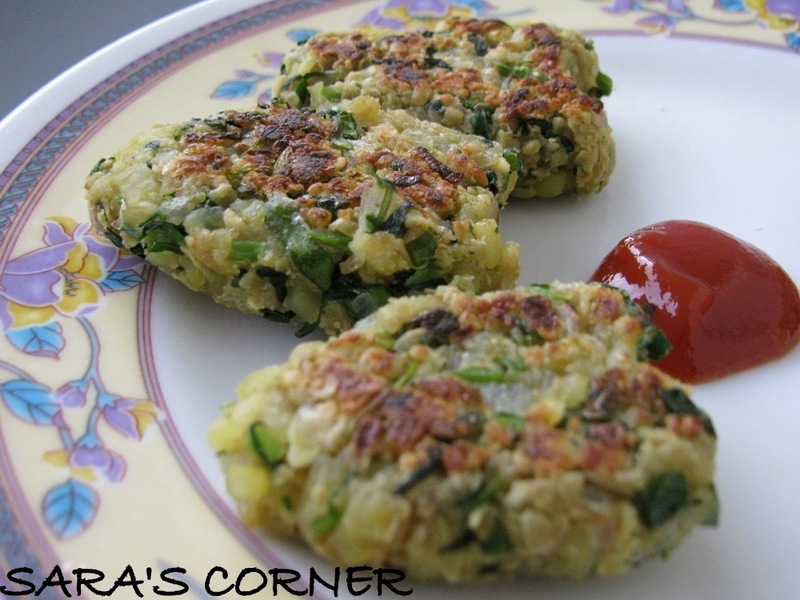 Healthy greens, baked cutlet looks delicious. healthy n guilt free appetizer..looks lovely n mouthwatering..
Oats and spinach combo makes this cutlet very healthy. Looks cute n healthy cutlet. Heyy...Found ur blog thru bookmarked event an glad to have dropped by!!! Simply love ur space...Now ur happy follower!! Healthy cutlet and nice combo. 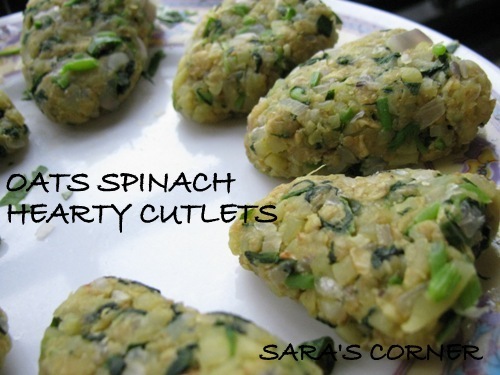 Looks so very delicious.. nice combo of spinach n oats! These cutlets look delicious, healthy and tasty! I am a big fan of oats and finger food :-) bookmarked! love it, will try today.Thanks for the recipe. Healthy recipe for a good health..
Cutlets looks cute,delicious and healthy at the same time, love it..
Nice idea to sneak up some greens dear..So glad to find out ur blog..Yum yum Recipes, Will try some of ur healthy recipes.. Thank you very much for posting this recipe. I have a packet of oats and was looking for some tasty recipes for it. I think I just found it!! Loved going through your recipe collection. You have got some good collection of recipes. healthy version...adding oats and spinach really gud.. Very innovative! and healthy too! :-) Bookmarking! !